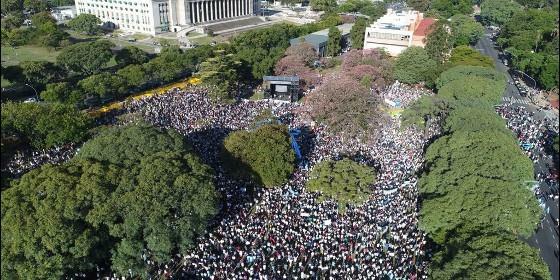 Catholic News World : #BreakingNews 1 Million at March for Life in Argentina - #ProLife Rally Fills the Streets! #BreakingNews 1 Million at March for Life in Argentina - #ProLife Rally Fills the Streets! In Argentina, 1 million took to the streets against abortion. Their signs read “Life has value” and “against the proposal to liberalize abortion”. The proposal to liberalize abortion will come into discussion in the national parliament after Easter. Buenos Aires streets were packed on Sunday as an uninterrupted stream of participants met in the afternoon towards the capital’s main streets, Calle Sarmiento, and then to Avenida del Libertador. Mainly families with children, mainly young people, but also average citizens joined. Signs in favor of life “at all stages”, no criminalization of mothers who have aborted, considered victims of their own decision and often abandoned by public structures, “the life of both” must be protected were on many banners. “Ni una menos” - not one less - could be read on many others, in reference to the campaigns against feminicide. Argentine bishops took part in the event. The 22 priests who work in the “villas of misery” in Buenos Aires have approved and published a document as a pro-life appeal, which has made a breakthrough in public opinion. In the text, they point out that the issue of abortion was not present in the electoral platform of President Mauricio Macri’s government and that “some proposals coming from other social sectors - we believe that this [of abortion] is one of them - take the poor as justification for their arguments”.